The robotics team finished strong at their final tournament in Cedar Falls. 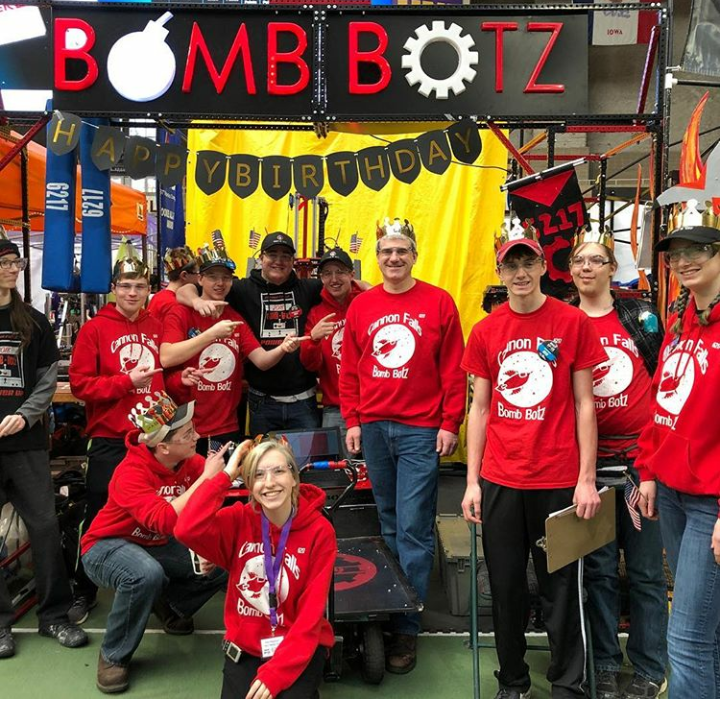 The Cannon Falls Bomb Botz posed with their robot at the Cedar Falls Regional tournament. What started off as a horrible joke, turned into the defining characteristic of the Cannon Falls Robotics team. During the Duluth regional, a member of the team suggested getting a loaf of bread to bring to give to the Master of Ceremonies instead of the normal flag. No one thought it would actually happen, until the Iowa regional rolled around and Tim Langdon, parent of team member Luke Langdon, showed up with two loaves of bread. One loaf was given to the event MC and the other was given to Preston Parks in the stands. From then on every team at the competition referred to team 6217, the Bomb-Botz, as “The Bread Team” or even better yet “The Bread Botz”. All in all, this robotics season was one of the best yet. Capping off their dream season, the team was able to win The Gracious Professionalism Award, one of the most coveted awards in FIRST. In the Duluth Northern Lights Regional, the team was plagued with a number of issues throughout the competition. The original intake system for the hatch panels wasn’t working as well as everyone had hoped, so the strategy had to change. With a drive train of four independently moving wheels (swerve drive), the team’s robot was perfect for playing defense, as it was nearly impossible for them to be pushed around. So near the end of the qualification matches, the team switched to playing defense in a last ditch effort to get picked for finals. The team was not chosen by an alliance to compete in finals, but they finished 13th making them the first reserve robot for finals. Unfortunately for the team, no robots broke down on the field, meaning that they didn’t get a shot to compete in finals, but their time would come. Two weeks after the Duluth Regional, the team traveled to Cedar Falls, Iowa to compete in the Iowa Regional. With a completely new mechanism for intaking hatches, the team was ready to get the bread. For the first few matches, the team got toasted, struggling with connection issues, but it was all uphill from there. The team finished 20th overall before entering into finals. While this score was worse than in Duluth, the team won their last four matches before alliance selection for finals. Hoping that energy would carry them to the world competition, the scouting team worked diligently to show other teams the strengths of their robot. All that hard work paid off in the end as the team was selected for finals by the 7th seeded team. The website was never supposed to be a one year project however. Souza plans on continuing to improve the website, even when he heads back to Brazil. “The website is not done. There is a lot we still need to do for the following years. We were thinking about making it accessible to other teams.” Souza also cites the support of his mentors and team members as contributing to the success of the application.